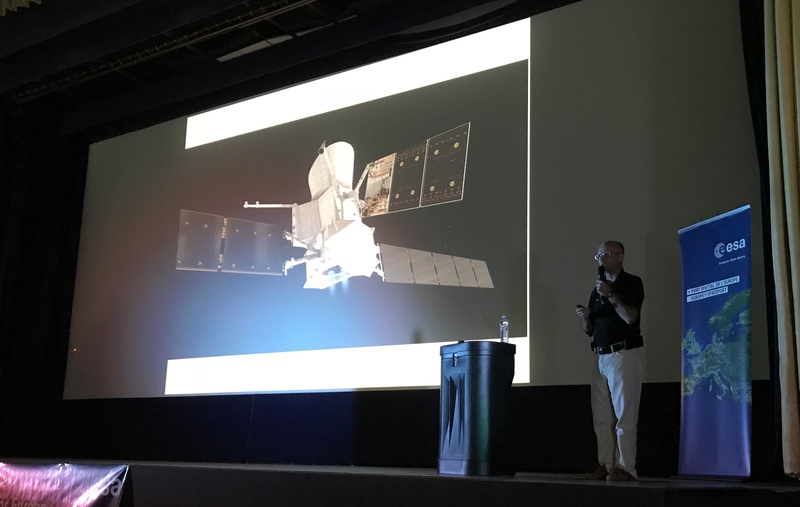 On October 11, roughly a week before the launch of BepiColombo, AIV engineer Bernard Guillaume presented the project to the general public of Kourou at the local cinema. This was the fourth such conference held in the town of Kourou — and the fourth presentation organised by ESA at the cinema — and it was evident that it was not the first presentation by Bernard on Bepi Colombo. The Project Manager, Ulrich Reinighausen, and Bernard Guillaume have presented the project countless times to visiting dignitaries, staff at the Spaceport, school children, engineers from other projects etc. Holding this kind of outreach events is a great opportunity of sharing our experience of “working in space” with the general public. During BepiColombo’s stay in the Payload Preparation facilities of Europe’s Spaceport in French Guiana, the incredibly interesting and complex set of three satellites that make up the mission have been one of the star attraction here (the other star being the building site of the new Ariane 6 launch pad). The project is fascinating and Bernard gave an excellent presentation so that the average person could understand and appreciate the complexities and challenges of the project. This helps explain that working with space is complicated and that success, if and when it comes, is the result of an incredible amount of hard and detailed work. Work over a long time, done by people who really care about what they do, and do their outmost to ensure success. The good, the bad, and the ugly behind creating a mission like BepiColombo — there’s a reason it takes decades to make these things!